We start the first day of the 48 hour family tour at NGV International - the international artwork section of the National Gallery of Victoria. 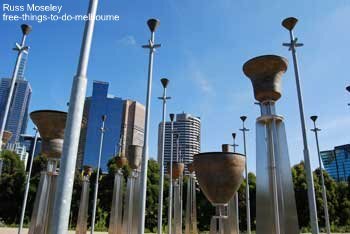 .........It's located at 180 St Kilda Road, just up from Federation Square next to the building with the white spire you can see from Federation Square. ...........And out the back is a great play area for them. It opens at 10am so make sure you're on time as there's a long day ahead! (It's closed on Tuesdays though so plan accordingly). Just before we go to the next main venue, why not pop in to the Arts Centre next door (beneath the white spire) as there's often exhibitions in the main entrance area suitable for children. ........On the other side of this road you'll find the Tan Track (check out what it looks like in my Tan Track page and you won't miss it). This track leads you all the way to the main entrance of the Royal Botanic Gardens. You don't need to run on this track by the way but lots of people do - it's quite famous in Melbourne. It was originally a horse track in Melbourne's very early days. 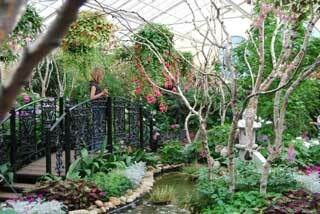 Go into the Botanics, past the cafe and on the right you'll find the Children's Garden. 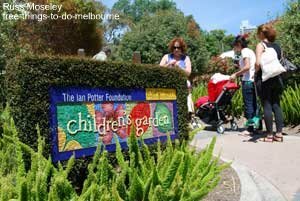 It's full name is the Ian Potter Foundation Children's Garden. ...........There were three turtles hanging around by the cafe when I was last there so check out this area. Next it's back up to the main Gardens entrance where you came in, cross the road and you're at the Shrine of Remembrance. There's a lot to see here depending on the age of your children. If they're really young you can just take them up to the top of the Shrine for a great view over the city. It's now time for a little free bus journey back to town. You'll see the bus stop back on the other side of the road you crossed to get here. ......... Click on the blue writing under the map to see it properly and press the +, - or arrow buttons at the top left of the map as required. Click on the blue markers to see what the attractions are. Take the bus back to Federation Square. Actually, it's a good idea to do the full bus tour as you'll see and learn a lot about Melbourne but it takes one and a half hours to do a complete circuit and so it's best left for a less busy day. ........Then it's off to Birrarung Marr! It's normally quite peaceful here unless there's a festival on. 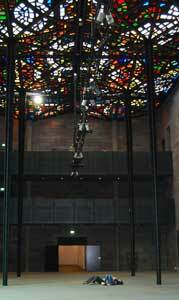 Check out the aborigine art items here too and a 2 or 3 minute walk will take you to the Federation Bells. It's best to time your visit to the Federation Bells to coincide with their ringing times at 12.30-1.30 or you can come back later between 5pm and 6pm. .........You can also watch free films in Mediatheque. Choose from thousands of films. 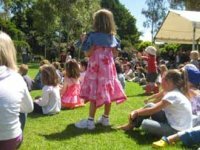 The last attraction today on the 48 Hour Family Tour (as there shouldn't be too much time left), is Fitzroy Gardens. .........The Conservatory (near the lower left hand side of the Gardens) has gorgeous flower displays all year round, there's a very interesting Fairies Tree and a miniature village to see (these are in a north east direction from the Conservatory) and lastly head to the playground at the top of the Gardens for the dragon slide, giraffe swing and sandpit. Well, that's the first day of the 48 Hour Family Tour finished. Hope you're not too tired! Here's this afternoon's route as a guide. Again, click on the blue writing under the map to see it properly and press the +, - or arrow buttons at the top left of the map as required. And click on the blue markers to see what the attractions are. Now you need to click here for Day 2 of the 48 Hour Family Tour.